Tudor is soing a good job? Many greetings to all members of Torcida Split ! Torino and Hajduk....a romance never consumated into marriage. When do we get to play them? how hard would that be? Stupid modern football that only cares for "cash earned"
A triangular would be awesome. Hajduk Split fans demand Croatian FA chiefs step downThousands of Hajduk Split fans held a mass protest against the Croatian Football Federation (HNS) demanding the resignation of its president, former Croatia international Davor Suker, on Saturday. Up to 20,000 people from Split and other areas of southern Croatia joined the protest in the city centre organised by the Hajduk supporters group Torcida under the title "Against the darkness, against the force", local media reported. "We demand the resignation of the key people in the HNS and we appeal to the authorities to stop irregularities and injustice in Croatian football," Torcida spokesman Damir Gruic told state radio. HNS spokesman Tomislav Pacak told Reuters it had no comment "for now", but may release a statement on Sunday. The protest was called after Croatia's biggest derby was scrapped last Saturday when visitors Hajduk refused to play against champions and league leaders Dinamo Zagreb after their fans were banned from entering Maksimir Stadium. Hajduk and their supporters said it was not just those blacklisted as troublemakers who were not allowed into the game in Zagreb and saw the move as further proof of discrimination against their team. Dinamo said they had been provided with the list of troublemakers by police. They have complained for years that HNS decisions are influenced by Dinamo, putting main rivals Split at a disadvantage. Hajduk have had to play three home matches this season in an empty stadium as punishment by the HNS for crowd trouble. Dinamo have won the last nine Croatian league titles. 8,000 Hajduk supporters in Poljud Stadium, lighting flares, singing and jumping as if they’ve just been brought a trophy, or at least an away win against Dinamo. Hajduk refused to play against champions and league leaders Dinamo Zagreb after their fans were banned from entering Maksimir Stadium (Dinamo Zagreb Stadium). Hajduk flag in the middle for our volleyball match against Vojvodina. Going to Split in August !!!!! 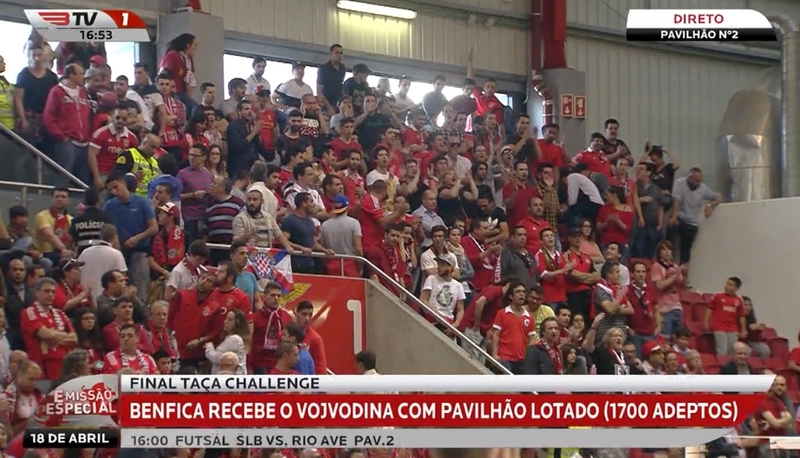 It already feels like I'll be Benfica friendly town.